In September 2011, I completed a roll out a complete class set of iPads for use in Social Studies, History and Astronomy classes. The big question that I have sought to figure out is how do I setup these tablets in a quick and efficient way. 1. 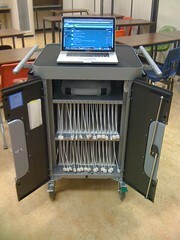 I got a Bretford iPad cart to charge and sync all the iPads. This cart arrived in one piece, no assembly required. It is made of solid steel and has heavy duty castors that enable it to be moved around easily. This car has one electrical plug to go into the wall, very convenient. It also has all the slots and cables ready to go for all 30 iPads: they are even laser engraved with numbers 1-30 to organize and keep track of them easier. There is also a shelf inside to hold your laptop. What I loved about this cart is that it is all pre-wired and ready to go; except for plugging in the power supply for the laptop...but this was easy. Recently I got some vinyl numbers and put them infront of the iPad slots because I found students had trouble matching up the laser engraved numbers above. 2. Next a 15" Macbook Pro computer was purchased. A Macbook is required to use for syncing to the iPads, a PC won't do. My understanding is that only a Mac computer can sync 30 iPads simultaneously to one USB port. I went through the setup on the Mac and charged it (its really easy). Then I had my school computer tech to setup some logins and printers to access. I love this computer. If you get a Windows computer then you will have problems syncing multiple iPads at once. So insist that you get a Mac so you don't waste your time syncing and upgrading. I think this is the best way to proceed since you don't want it linked with your personal account. I also bought some itunes gift cards and loaded up the account with some money to purchase apps. Mostly we are using free apps and they will sync automatically to all devices with easy account management. I await the App Store Volume Purchase Program for the Canadian market. 4. Open up itunes on the Macbook and sign-in to your newly created itunes account. Then I started to download apps that I wanted to use that fit with the teachers and classes that will use them. I will be doing another post later that will go over my app choices and reviews. I tried to keep my choice to mostly free apps, but I have a few exceptions. 5. Our school district requires all technology to be bar-coded and serial numbers recorded for inventory purposes. This was handled by our library and didn't take too long. 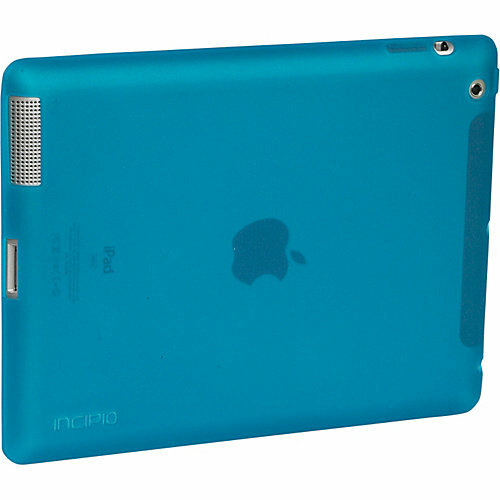 These codes will be covered up when we get the Incipio iPad 2 Smart feather Ultralight Hard Shell Cases. Eventually we will get matching SmartCovers for them, but they are too expensive to afford at the moment. UPDATE: These Incipio Smart Feather cases started to break. Incipio took them all back and swapped them out for another model. I think that this new model is much better to protect the iPads. 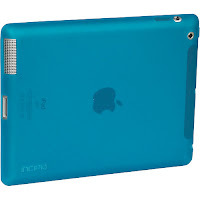 I ended up getting the Incipio NGP Matte Semi-Rigid Soft Shell Case. This case does not work with the SmartCover, but we have now decided we don't need it. This is mostly all I did to start. Then I waited for the iPads to arrive. Now when the iPads finally arrived. 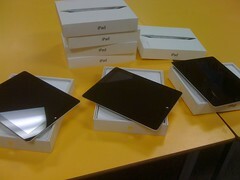 I waited with anticipation for the first shipment of iPads to arrive. 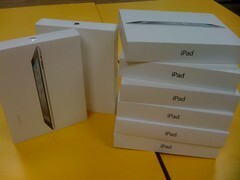 We waited about 2 months for the first 8 iPads to arrive. The rest of the 30 arrived a couple of months later. Once they arrived I was eager to get my hands on them and begin the setup. 6. The first thing that needed to be done was to get the iPads inventoried, labeled, and bar-coded. This again was done by the library. The serial numbers are really small numbers and hard to read on the back of the iPad, so I recommend that you read the number off the iPad box instead. 7. Now the iPads are all mine to begin to setup. The first thing I did was to unpack them and take off the protective plastic cellophane wrap. Since I don't have hundreds of these to do, I don't need a big production line. I got some help from another teacher who will be using them also. Example of background image I used. 8. What about numbering the iPads. Originally I was hoping to be able to have Apple do free engraving on the back with "Property of School District# " and also add a unique number to each. But, this was not possible because purchasing of them was done at the School Board offices and I had no control over where they would buy them. Also, If I put a number on the back of the devices, it would be likely not seen because they would be covered up by a case. So what do you do? I ended up setting the lock screen image to be different on each iPad and contain a unique number with the school logo. Then I put a passcode lock the device with that same number. This, I think will make the iPads easy to identify because they will fit into the Bretford sync cart's individually numbered slots. This will make it clear to each student and me what number each iPad is. This will be important because students will be required to use the same numbered iPad each day. 9. The iPads are really easy to setup. You just plug them into your Macbook via a USB sync chord and follow the onscreen instructions. Unfortunately, you need to do this individually for each device for the 1st setup. Once I did the iPad setup and logged into the itunes account, I was able to do my first sync of all the devices at once. 10. I have found that for major iOS updates that you can't use the Bretford Cart to sync and have to plug in each device one at a time. For more thoughts on this I did another blog post that you can read here. 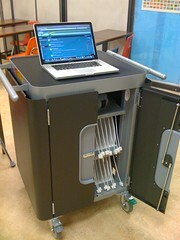 Now that the iPads are fully setup, the most difficult part is integrating them into your everyday classroom. What will you change? How? You can't keep doing things the same way that you always did in your classroom. But, on the other hand you don't want to over rely on the device and loose focus on curriculum and instead put all your focus on an iPad. How to setup iCloud for "Find my iPad"